The Papagiannakos Winery is surrounded by the sea which protects and nurtures it. The fruit of this land is borne of soft winters and warm and benevolent summers; an ideal environment for the cultivation of vines. It is close to Temple of Artemis, the haunt of Dionysus, the patron saint of wine, where for centuries the ancient method of wine production has been maintained and the vine has been lovingly cared for. 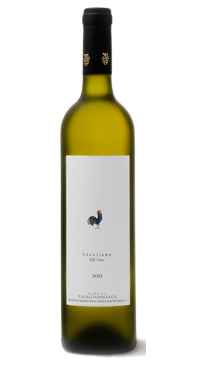 Made from 50 year old Savatiano grapes grown on non irrigated limestone soil. Bright gold and clear in colour, delicate bouquet, aroma of citrus. Medium acidity, long and pleasant aftertaste. A fine accompaniment to Mediterranean dishes, seafood, fish, white meat.